The first supermercado we passed in Recife was closed, as was the second. Those were strong signs as to the relatively shut-down nature of Brazil minutes before the hosts of the 2014 World Cup took on Mexico. 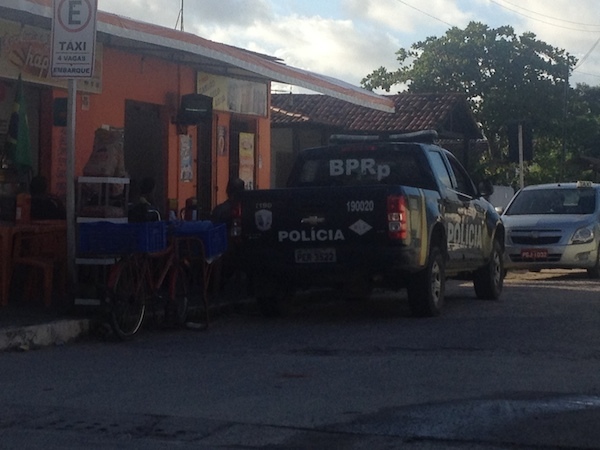 But it wasn’t until we saw the polícia chilling in plastic chairs on the side of the road, their eyes focused on the small television anchored to the wall of a building, that it really hit home: The country had stopped for the next two hours. Little-known rule: When a country shuts down because its national team is taking the field, you find a bar and watch. 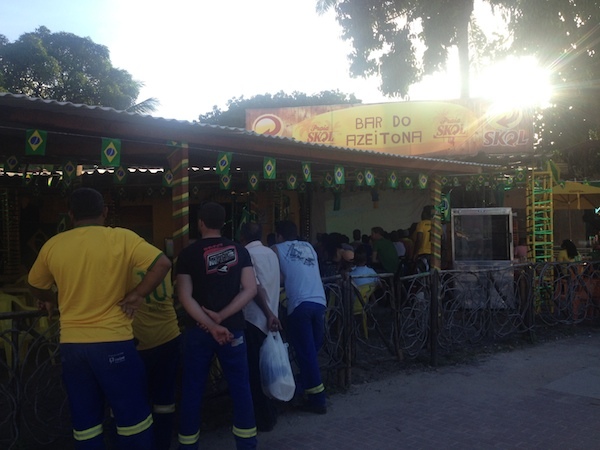 A cherry-picker truck sat outside Bar do Azeitona (the Olive Bar), its emergency flashers on and two members of the four-man staff hanging over the railing, wearing Linha Energizada–issued blue pants with fluorescent yellow trim and Brazil jerseys. Click here for more on the 2014 World Cup. 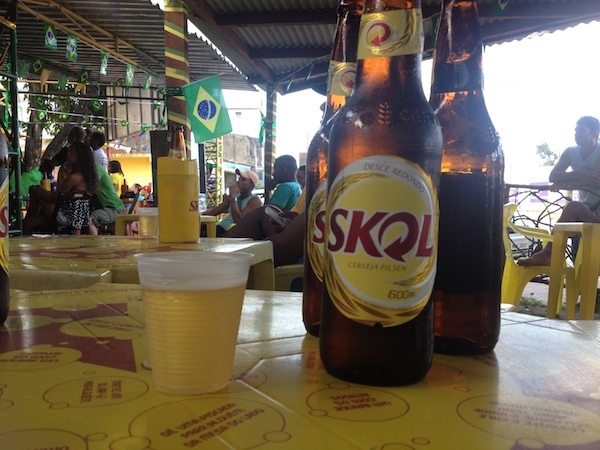 Inside, there were 600-milliliter bottles of Skol and Schin, along with flies and bugs and excellent carne de sol. We sat in Brahma chairs at Skol tables with another 100 people. The Neymar Jr. jerseys — of varying stages of authenticity — outnumbered those of all other Brazilian players combined, although blank-backed yellow-and-green tops were the majority. Really, Brazil jerseys need no last names. Viewing options were a small television and a huge projection screen. We chose the former, owing to our late arrival. Also, the projection, which had the sound system hooked up to it, was a few seconds behind the television. This led to a strange situation where the majority of people in the bar would cheer after a few already knew what had happened. Despite this, the guy next to me would stand up in anticipation as a Brazilian forward streaked upfield while the rest of the bar started to buzz. He understood it was futile, but it was as if he were willing the projector to change the outcome. He failed, time and time again. After Dani Alves — sporting, for some reason, gray hair — failed to turn the corner on his defender, the pretty bartender in the no-name no. 10 jersey (so … Neymar Jr.) slammed her hands together in frustration. During the ensuing corner kick, she barely paid attention as she handed a patron a Skol. A quick burst of fireworks in the surrounding neighborhood announced halftime. The Roman candles were supposed to celebrate goals, but they needed to be used for something, and a loud expression of frustration would have to do. Moments later, a sharp, acrid smell drifted through the air, which was sort of magical if you didn’t have a dog in the 0-0 draw. 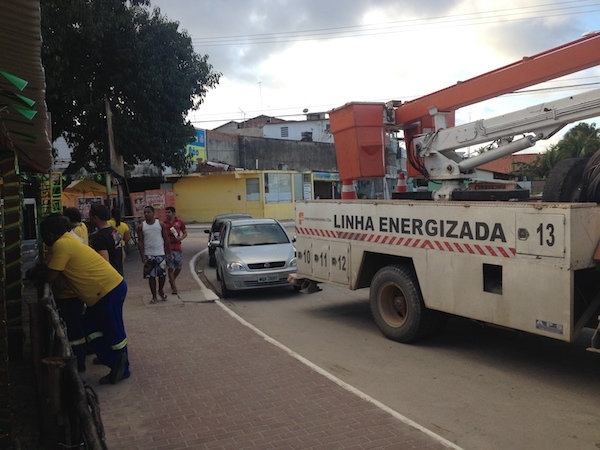 The Linha Energizada workers had departed. A handful of police officers replaced them on the railing, the lights of their pickup flashing in the breakdown lane. About 4:45 p.m. on Tuesday would have been an excellent time to rob a bank in Brazil. Just saying. If you’re looking for the outlaw, look no further than Guillermo Ochoa, whom everyone calls Memo. The Mexican goalkeeper stoned Neymar and Oscar and, probably, Socrates. (The television screen was a little blurry.) He kept El Tri in the match, frustrating the Samba Boys, the crowd at Bar do Azeitona, and presumably about 200 million other people around the country. Maybe Brazil isn’t that good? is a thought I had in about the 55th minute, as Giovani dos Santos found a half-chance and Mexico looked dangerous for a spell. I didn’t verbalize it for fear of death. On the bench, Big Phil Scolari looked worried, as though he might be having the same concern. The hosts easily could have lost to Croatia in their opening match. And they certainly weren’t world-beaters against Mexico. You don’t want to strain a metaphor, but it started getting dark around 5:15 p.m., with 30 minutes to go in the match. By the time Thiago Silva had cannoned a header off a free kick that Ochoa saved with some sort of Matrix self-defense move — I swear I wrote that joke before I saw this — the result felt inevitable. Probably unfair, as Brazil deserved a goal (and, hell, Mexico might have, too), but inevitable nonetheless. The number of goals would equal the amount of work done in Brazil during the 90 minutes of the match. Roughly, of course. I’m sure those dudes did something in their cherry picker after halftime. Near the end, Marcelo, attempting to fight the result we all knew was coming, tried to draw a penalty with a dive, and the beautiful game turned ugly for a split second. Turkish referee Cuneyt Cakir didn’t blow his whistle. It was dark by then anyway. Noah Davis (@noahedavis) is Grantland’s United States national team columnist and deputy editor at American Soccer Now.